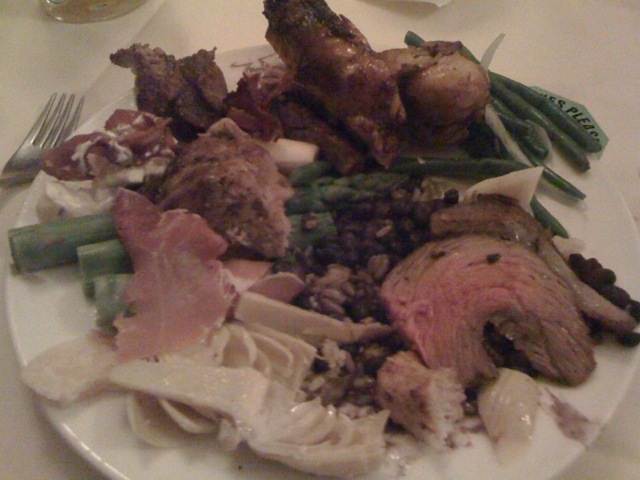 A plateful of delicious Brazilian meats! yomm. Food from the past couple of weeks...starting with 9pm supper for one. Dumpling-making: like old ladies around a kitchen table. Pork potstickers steam-fried. Artful dinner at Jules': sesame panna cotta topped with blackberry mousse, seared figs and bananas, mediterranean chicken stewed with prunes and potatoes, broccoli rabe, and couscous. 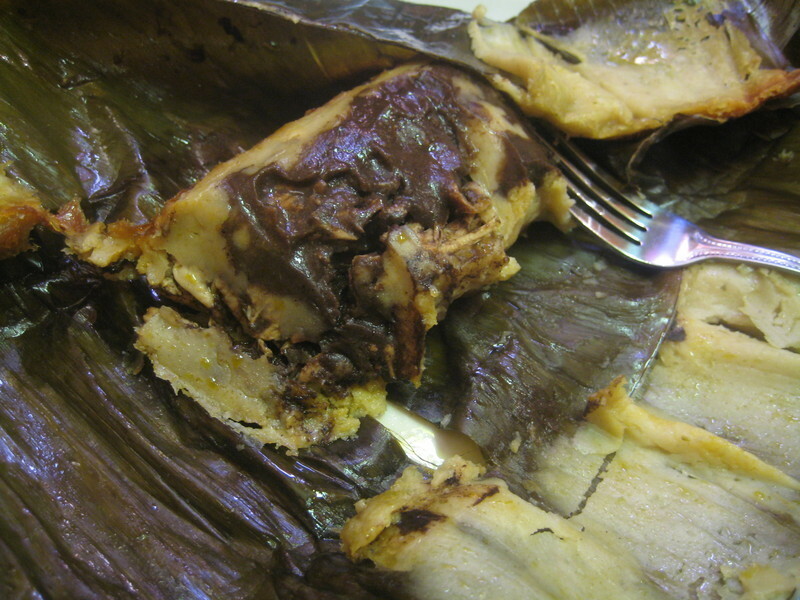 Banana leaf wrapped corn tamale stuffed with turkey in mole sauce. $4.25 at La Oaxacena in the Mission. So unbelievably delicious. When I ordered it, I thought the concept of "samosa" was figurative. I thought maybe they stuffed some potatoes inside the burrito. 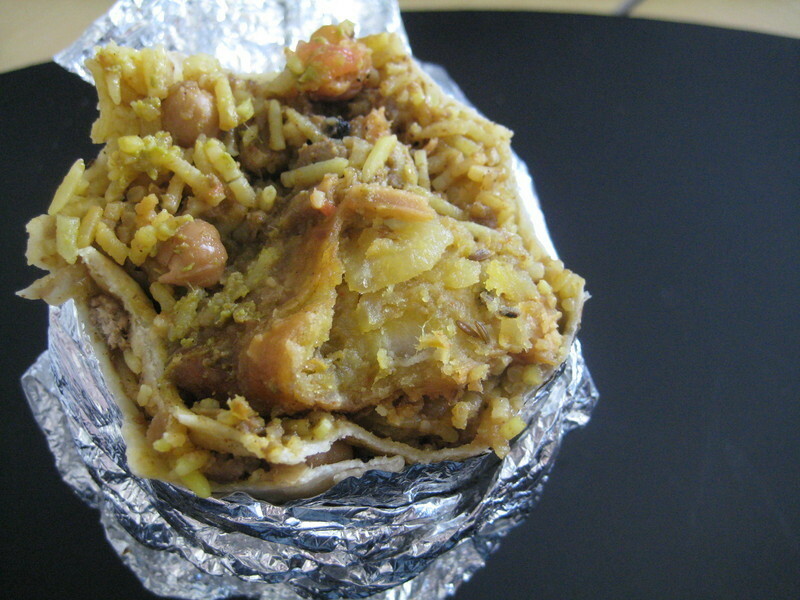 But no, when I bit into the burrito, I found spiced rice, pickles, chickpeas....and AN ENTIRE DEEP-FRIED SAMOSA. Inside. My burrito! If this is not worthy of a submission to This Is Why You're Fat, I don't know what is. The burrito, by the way, was gloriously tasty. I ate half of it and it sat like a log in my stomach all afternoon. Check it out at Curry Up Now (they now take online orders in advance!). Food in Vancouver is out of this world. 5-10 Fried chicken cartilage (crunchy! ), kimchee yaki udon, various dellishous skewers (quail egg wrapped in pork, savory mochi topped with kraft singles, etc) at Zakkushi Grill. Also had their ginger beer which was light and tasty. 12 Ridiculously rich cheese ramen at Kintaro (handmade noodles in homemade pork bone tonkatsu broth topped with shredded mozzarella and the fattiest pork slices I've ever seen). I actually preferred the shio ramen with lean pork. 13-14 JAPADOG, quite possibly the greatest thing we ate in Vancouver. Totally worth the 30 min wait. In the rain. 15-16 Dandan noodles and beef chow fun at No. 9 Cafe in Richmond. If you meet a picky eater who won't eat his/her veggies, maybe you ought to try feeding that fussy-fuss some PURPLE VEGGIES. Because they are so much fun, and tasty besides. You may already know I have a penchant for purple things that normally come in other colors. I should clarify: I have a penchant for purple vegetables that normally come in other colors. Bruises and other bodily injuries do not count. 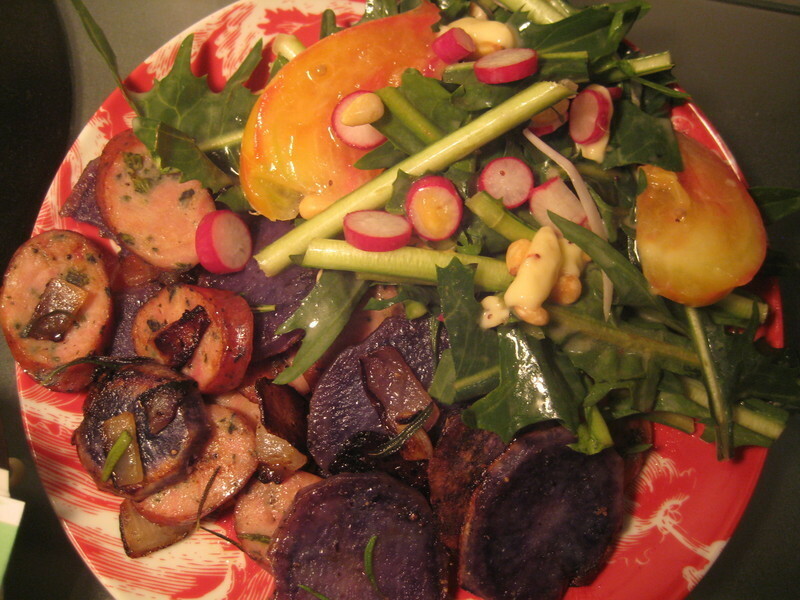 I got these gorgeous purple carrots from, where else, Berkeley Bowl market. I love getting things there that I can't get anywhere else. I was dismayed to see that the purple color was so delicate - even rubbing the carrots too vigorously while washing took away a lot of the color, so I didn't even bother peeling them. I thought maybe like potatoes and bell peppers, the purple color would turn brown upon cooking, so I tried a couple bites of raw carrot and made a face. I do not like raw carrots. So I cooked it. With sliced zucchini, mushrooms, and lots of garlic! The purple color ended up holding well, which made me happy. I'd say it was a delicious success. Lovely earthy texture, and the flavors went so well together I just wanted to shovel it in my mouth and dish some more. Anyway, for starch I was attempting to make a supposed carbonara sauce and failed, but it was still tasty. I even browned the butter before frying my gnocchi in it. But the gnocchi were much too hot, and as soon as I dumped my egg/parmesan mixture, it curdled and became scrambled eggs. I tried to thin the mixture with some pasta water but it was a no-go. 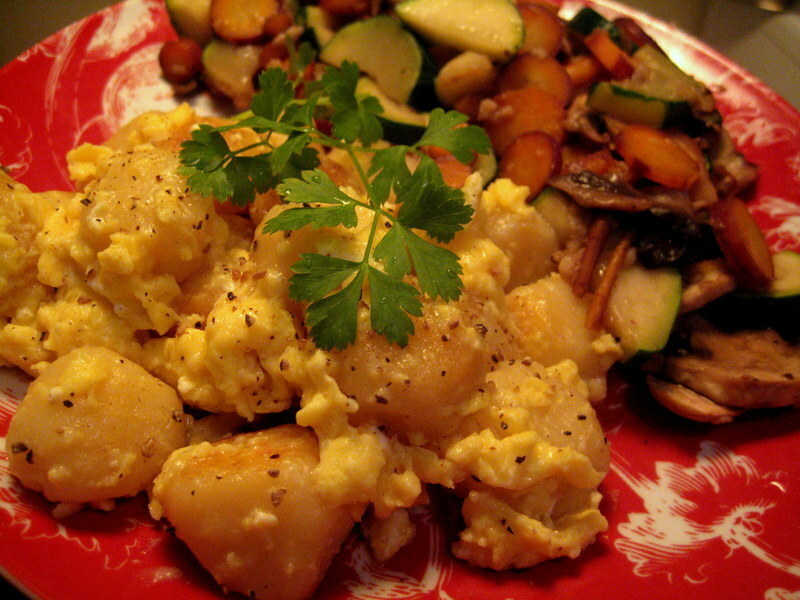 Scrambled eggs they were, and scrambled eggs they remained, with delightful little lumps of potato gnocchi. Finished off with some salt and pepper, it still made a wonderfully simple and satisfying dinner. For the second weekend in a row, the four of us made meatballs. Last week it was pork meatball banh mi, from this month's Bon Appetit, which in our hunger we totally forgot to document. 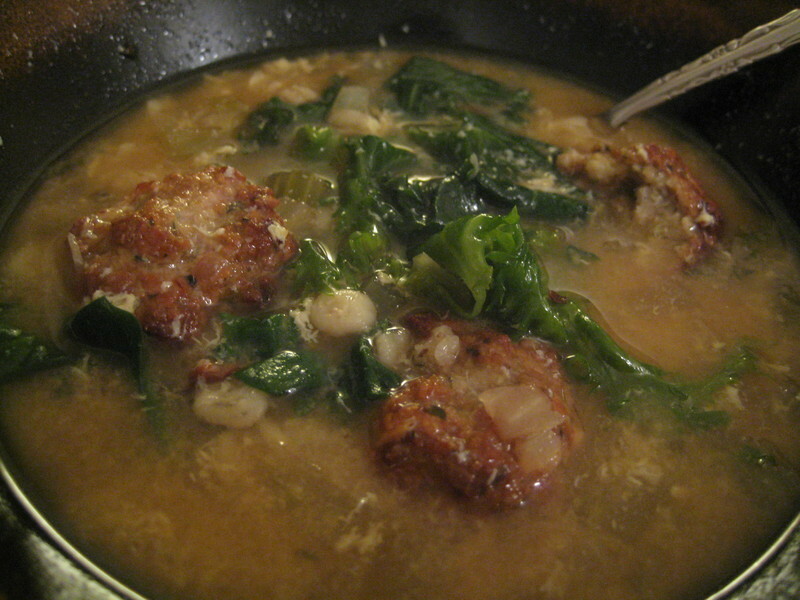 This week I made an Italian wedding soup adapted from both Giada de Laurentiis and Ina Garten's recipes. I am not positive, but I'm pretty sure my version married the best of both worlds, pardon the pun. I really liked how flavorful the meatballs were after browning in the oven - much better than they would have been just cooking in the soup directly. 1-1.25 lbs. ground meat (I used a mixture of 1/2 lb. ground pork, 1/2 lb raw hot Italian pork sausage, and about a 1/4 lb. chicken sausage, all casings removed). Preheat oven to 350 degrees. Process onion, garlic, and parsley until minced. Hand mix ground meat with grated parmesan cheese. Add onion mixture, bread crumbs, egg, salt and pepper. Combine well but don't overmix. Line baking sheet with parchment paper and roll meatballs, about 1-1.5 in. in diameter (they don't have to be perfect). Bake for 30 min. or until meatballs are nicely browned and cooked through. Cook onions and celery in olive oil over medium-low heat until translucent (do not brown), about 5-10 min. Add chicken stock and bring to a boil. Add barley and cook until ready (about 15-20 min depending on how "done" you like it). Add veggies and cook until just barely wilted, about 1-2 mins. Add beaten eggs into soup, the way you would make egg-drop soup. Finally, add cooked meatballs and stir until flavors are blended. Serve immediately. Hearty, delicious, and perfect for cold weather! And, it was surprisingly easy to make. We also had a caprese salad (burrata, heirloom tomatoes, olive oil, balsamic, prosciutto) on the side and ollalieberry pie for dessert. 10pm supper for one: Red quinoa "fried rice." 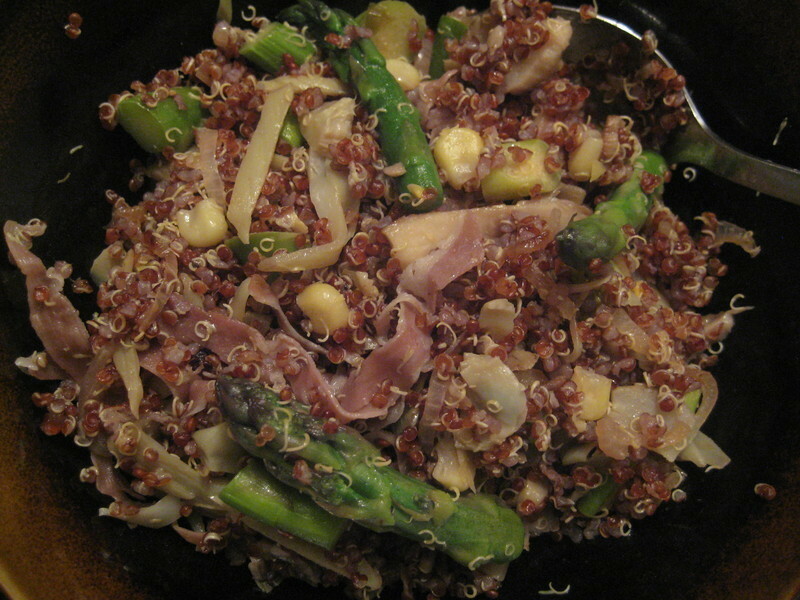 (In order of appearance in my pan...) shallots, asparagus, oyster mushrooms, artichoke hearts (frozen), white corn (frozen), pine nuts, prosciutto, a tiny bit of Parmesan cheese, and of course, red quinoa. Quite possibly the most nutritious meal evarr, making up for the delicious cabeza and carnitas tacos I had for lunch today. Quinoa is the only grain that contains complete protein, is high in fiber, full of antioxidants, and super delicious. Otherwise, I haven't been to a fast food chain (besides In-N-Out, which doesn't count!) in about 2 years. Yes the Wendy's fries were yummy, but I felt pretty gross afterwards.